Mary Ellis, an elite airwoman during World War II, died Tuesday at the age of 101 on the Isle of Wight. Her story is one of the most remarkable and endearing of the war, as this young woman, serving as a ferry pilot with the Air Transport Auxiliary, transported aircraft for the RAF, including fast fighter planes and huge four-engine bombers. Mary flew no less than 400 Spitfires and seventy-six different types of aircraft over the course of her career. Mary was a pioneer in her field, one predominantly ruled by men. Often, those men would not believe that she was capable of the feats that she would frequently accomplish. On one occasion, when Mary delivered a Wellington bomber to an airfield, she climbed out of the aircraft and was greeted by a RAF ground crew demanding to know where the pilot was! Mary said simply: ‘I am the pilot!’ Unconvinced, the men searched the aircraft before they realized a young woman had indeed flown the bomber all by herself. After the war, she accepted a secondment to the RAF, being chosen as one of the first pilots, and one of only three women, to take the controls of the new Meteor fast jet. By 1950 the farmer’s daughter from Oxfordshire with a natural instinct to fly became Europe’s first female air commandant. If you would like to know more about Mary’s exciting life, you can hear about it from Mary herself in her biography, A Spitfire Girl. In this authorized biography, the woman who says she kept in the background during her ATA years and left all the glamour of publicity to her colleagues finally reveals all about her action-packed career which spans almost a century of aviation, and her love for the skies which never faltered until the day she died. 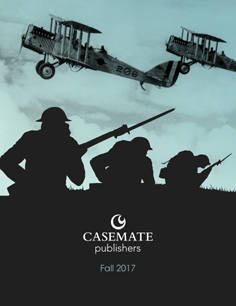 Casemate’s Back to School Backlist Bonanza!